Julie Kagawa, I just can't quit you. The Iron Traitor (Goodreads | Amazon) is not my favorite of Kagawa's works, but she did enough that I find myself shelving the 3rd in the series to be read on Goodreads and wondering where the story goes from there. Because that ending, be warned, is a whammy of an ending. 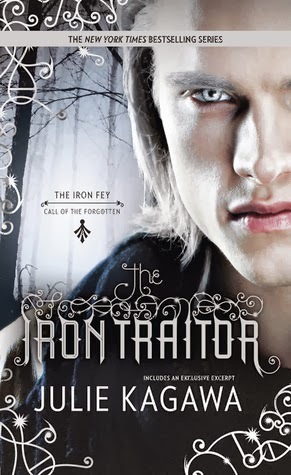 My problems with The Iron Traitor are similar to my problems with The Lost Prince (review here). As much as I wanted to like Ethan, that little boy Meghan sacrificed so much to save, I just do not connect with him that much. He's brooding, angry and surly, whereas Meghan was wide-eyed and innocent when she stumbled into faerie. Ethan puts up walls to protect himself, which makes it hard for other people to connect with him (both characters and readers). The biggest problem for me continues to be his relationship with Kenzie. There is too much bickering about their relationship, too much him telling her not to come to protect her and her getting angry and insisting on making her own choices. Too much Kenzie calling him "tough guy" and me groaning because pet names can get really annoying when they are repeated. For all of Kenzie's being superglued to Ethan's side, she doesn't really do anything throughout the whole novel, except bossing Ethan around. She's pretty ace at shouting at Ethan but if she's going to be in the story I'd like her to be relevant. As far as plot, the relationship drama dragged down the story. Once they arrived in faerie and the action really started, the book hit it's stride from their meeting with the deliciously evil Queen of the Seelie Court, to frolicking Puck showing up and the original brooder Ash even makes an appearance. All of that leads up to an ending that took me completely by surprise. Will you like this sequel? It probably depends on how much you liked the Ethan/Kenzie dynamic in the first book. I received an advance reading e-book in exchange for an honest review. Is it quiet around here? Follow Friday - Magazines WHAT?